I have always been proud of my clan. It is as a pride instilled in me by my father and in him, by his father before him. Although for three generations my family have not lived in Gezunel, our bonds to our clan hold firm, unified though ancestry and bonded through kinship. My grandfather (that is to say my fatherâ€™s father Grenak Hazorin) would tell me stories as a child of battles with orcs beneath the mountains of Dragonspine, before Gezunel ever came into being. This was in the time known as the second age, a time long after the fading of the influence of the Akarti. It was a time of Elven dominance on the upper world. 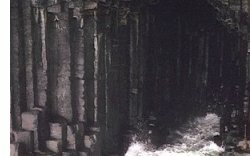 But we dwarven kind retained an influence underground, in the channels of hewn rock that had remained dormant for eons. My grandfather told of daring deeds as I sat at his feet, in wide eyed wonder! He had a natural distrust of elves which was deep seated. "It was they who forced the dark beastlike trolls, orcs, goblins, kobolds into our caverns and tunnels. Where in the Huntress's name did the Elves expect them to go when they drove them from the so called civilized lands! " My grandfather would always light his pipe at this point. It was almost a ritual. Then he would turn to me and add with a wry smile and a wink: "It takes more than an orc to kill a dwarf"
His stories from this era took shape in my imagination in the form of a young dwarf who he claimed as kin - Brenal Tevak. He described this young dwarf as a ruddy faced, fresh eyed adventurer, already bloodied in battle by his 15th year, extremely young for a dwarf. But his talent lay in the manipulation of metal and the forging of weapons. He did not know it then but this talent was to determine the clan to which he would later be affiliated. In his lifetime he saw the development of Kalaza beneath the Dragonspine Mountain thanks to dwarves skilled in the crafting of lumber and ore together for the creation of simple buildings. This construction took place under the guidance of their Dwarven Overking, Khazi Khazar, Kalaza expanded. My grandfather told me of a cavern created within the earth, where the dwarves would gather to share stories, as well as to offer protection in the case of an orc invasion. "The great hall of Kalaza was said to be 15 dwarves in height, with pillars so wide it took six dwarves to reach around the circumference!" He would stretch out his arms and spread his gnarled fingers out to emphasise the point. Of course my grandfather was prone to exaggeration somewhat at times, but I have no doubt that the dwarves of that time had to skill to construct such an edifice! Indeed some of the modern historians have now documented this as fact. The clans became more formalized with the own hierarchies and clan chiefs. Dwarves drifted into like minded and like-skilled groups. Some specialized in the manipulation of specific ores. Others in the waterchanelling or tunneling. Most were patriarchal including the clan to which Brenal Tevak's found kinship - the Kazunel Clan. The Kazunel Clan excelled in the art of manipulating ore for one purpose....the creation of perfect weaponry. My grandfather told me that Brenal believed strongly in strength in arms. The constant threat of attack from the orcs under the Earth only served to confirm to him that the survival of the dwarves was dependent on superior force of arms. His opinions had been somewhat tempered by his experiences at an early age and over at over 100 years of life his experiences had strengthened his belief that a salvation (of sorts) would come from focusing all efforts on the secrets of the forge, creating weapons of far greater strength and durability than that which had been previously known. 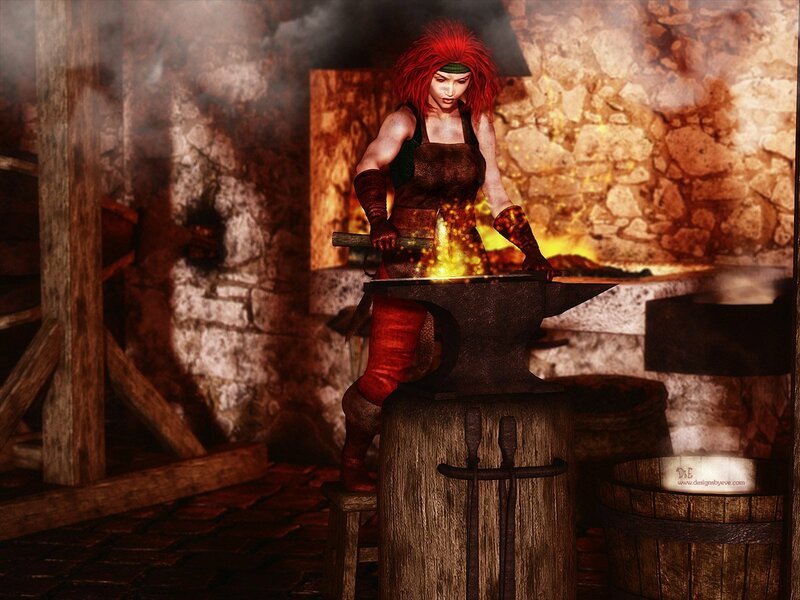 "It is that skill in the forge which has made the Kazunel Clan the most skilled of all the races as weaponsmiths " my grandfather would tell me with a puffed out pride. " How we thrived.." My grandfather would become animated at this point. " We acquired wealth that was immeasurable. Vast hoards of gems. Weapons and armor that was prized by all races! But.." He sighed heavily. "... things never last.. We were on the dawn of a new age. The age of chaos." It was always strange to me how my grandfather's voice changed when he spoke of the age of chaos and of Despana. His demanor changed from one of pride to one of somber resolution. He always brought his head closer to mine until I could almost feel his whiskers brush my face and I could smell the stale ale on his breath. My eyes widened instinctively. "Nobody knew just who or what Despana was." He would always begin this way, his tone so low that I strained to capture each word. "But they knew the evil that came with her. It was she who created the first of the Undead. Joined by entire tribes of orcs, and led by the arch-lich Dharthiir, their began their plans for conquest over the elves." "Whatever induced us to become involved!" My grandfather would shake his head and sigh slowly. "Let this be a lesson to you Bremerial. Pick your battles wisely." He would nod sagely as he jabbed a knowing finger in my direction. I always nodded in understanding. "But.." he would add, " when the Overking Gerfroth Khazar agreed to support the Elves, all clans were honour bound to send dwarves to lend aid against the threat. Over 2500 brave dwarves went out to face the hoard. Little more than 600 returned. Brenal Tevak had long since passed. But his great great..." My grandfather would pause and count on his fingers. "...great grandson Aravek Khavik was lucky enough to return. Then to die of red rot.."
This part of my grandfather's tale always sent a shiver down my spine. Even recalling it these days unnerves me. The Red Rot, believed to be some last strike or seed of Despana's magics, infected strong and weak dwarves alike, even Overking Khazar and his entire line. It was believed that this disease was in the very fabric of the cavern itself. . It swept through Kalaza like a firestorm, killing over half the population. "You could say child that Despana was the single biggest influence on modern dwarves, for from that time onwards clans ruled themselves. There were no more Overkings to give guidance. Each clan had it's own clan chief. Fearing the disease the dwarves sought to leave Kalaza. The gates to the city were concealed under an avalanche of concealing stones and the great emigration began. " 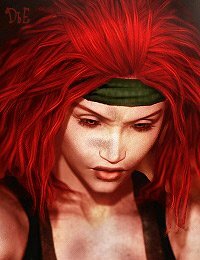 "Our clan, The Kazunel, along with the Reznek Clan, and the Smaelton Clan searched for caverns where they could begin their lives anew. We were and always will be mining clans. The Kazunel built their cities along the smaller flows of lava deep below the Dragonspine mountains to the south of Kalaza. And thus Gezunel was born." At this point my grandfather would test me to see if I had been paying attention. "And what did we create?" " And where were those forges located.."
" On top of the lava flows where only the most skilful could work with the strongest magical metals"..I would answer interrupting his question. At this point we would both laugh. Of course my grandfather knew that I knew this. Every Kazunel clan member knew this. 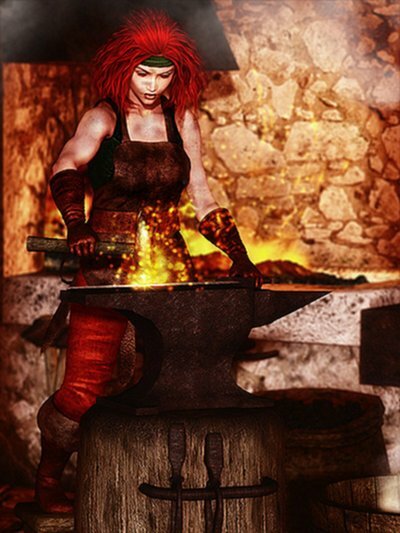 We all knew also that in later years, mages were invited to add their elemental magics during the forging process resulting in the creation of even more powerful weapons. My grandfather always told me that it was his own father's (Algarak Sedeg ) admiration for wanderings of The Roramnoak Clan that took him away from Gezunel. The Toktrog Clan may have had skill in establishing new trails but it was The Roramnoak Clan who established some of the main exchange points for trade. Indeed, the Roramnoak Clan was the most significant contributor of dwarven products into the hands of other races throughout Elanthia. Algarak also had a curiosity about other races which was unusual as the natural inclination of dwarves was that of isolation.. Algarak found willing buyers in the frontier town of Wehnimer's Landing, taking his son, (my grandfather) with him. And it was there that the next two generations were born and raised. And there I would have stayed, quite content, had it not been for the death of my father. I confess that I have only lately sought to perfect the skills of my clan in forging weapons. This was not due to lack of aptitude - as this is an almost innate ability of my clan - but rather to a lack of application. I had always intended to follow this path. However memories of the death of my parents in 5095 at the hands of invading undead hoards has never left me. The profundity of that single incident caused me to change intended focus from the mastery of weapon creation to the mastery of weapon use and the deployment of those weapons against all creatures that sought to attack my home. I shied away from the teachings of Lord Eonak to that of the lesser spirit 'The Huntress'. However I came to realise that pure vengeance was a self destructive force. I found temperance through the order of Voln, with it's emphasis on the release of the undead souls. Equal service to both of these lesser spirits seemed and continue to seem to make sense. I am now following the path of weapon making and in so doing honouring my parents and my clan. As my grandfather always taught me, there is nothing that a Kazunel dwarf cannot accomplish.